Here are all the Calvin & Hobbes books by Bill Watterson in cronological order. Why not buy one them from Amazon as gift and support the Calvin & Hobbes Jumpstation. Is your collection of Calvin and Hobbes books complete? A new collection called "The Complete Calvin and Hobbes" with all the Calvin and Hobbes strips ever published has been released. This is a must have for any Calvin & Hobbes fan for Christmas, take a look at it here. Calvin and Hobbes: Sunday Pages 1985-1995. September 2001. It's a Magical World : A Calvin and Hobbes Collection. October 1996. There's Treasure Everywhere : A Calvin and Hobbes Collection. March 1996. Homicidal Psycho Jungle Cat : A Calvin and Hobbes Collection. October 1994. Revenge of the Baby-Sat : A Calvin and Hobbes Collection. April 1991. The Authoritative Calvin and Hobbes : Includes Cartoons from Yukon Ho and Weirdos from Another Planet. October 1990. Weirdos from Another Planet. March 1990. The Calvin and Hobbes Lazy Sunday Book : A Collection of Sunday Calvin and Hobbes Cartoons. September 1989. 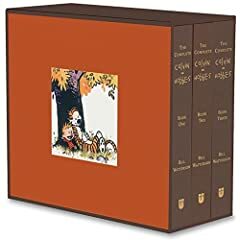 The Essential Calvin and Hobbes : A Calvin and Hobbes Treasury. September 1988. Something under the bed is drooling. The second book from April 1988. Calvin and Hobbes. The first book from April 1987. Last modified: Nov 26 2005.